One of DO-ITs dedicated account managers, Frank, had a dream about farming in North America where the fields are endless with no horizon. At Biofach 2010, Tyler Remoué and Frank met for the very first time at the DO-IT booth: Canadian organic farmer meets sales manager from Holland. “We were both very interested in the different worlds we lived in, and a few years later both worlds came together when Germonde and I moved from Holland to Rockglen, Saskatchewan. The dream was no longer a dream”. Poppe Braam has always been a connector between organic farmers from all over the world and the food industry. In this case it was very apparent, as one of his sales managers became a farmer/sales manager at Remoué Family Farms Ltd.
Today their farm is proud to be a partner of DO-IT, and not just for this one farm. “With a group of about 10 organic farms we supply DO-IT with organic black lentils and organic French green lentils through Remoué Family Farms Ltd”. A unique supply chain, open and as short as possible. Remoué Family Farms Ltd is a family-owned organic farm, located since 1911 in the beautiful rolling hills of Rockglen, SK, Canada. Being the 4th generation, Tyler Remoué and Kalissa Regier are young dynamic farmers who are connected to the modern food industry. Living on the farm they are both very passionate and committed organic farmers with many ideas to improve organic farming now and in the future. Today Remoué Family Farms is one of the largest organic farms in Saskatchewan with 2000 hectares of 100% organic farmland. For Frank and Germonde this opportunity to follow their dream became real and it was never a disappointment but a better life than they had imagined. In 2017 they bought their own property of 130 hectares to extend organic farming together with the Remoués. The land was bought by the Remoué family in 1911 when they emigrated from France to Canada. Frank is now a member of the board of directors of SaskOrganics. 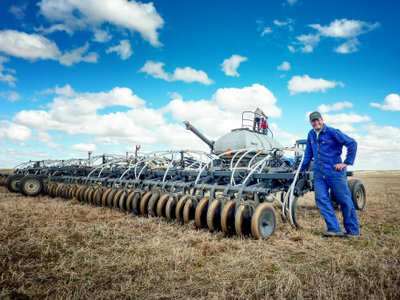 “Being active on the board of directors of SaskOrganics, I try to connect more organic farmers from Saskatchewan to the food industry and to export markets. As SaskOrganics we also try to convince more conventional farmers to make the transition to organic. We are very active at tradeshows in our province and we also organize transition workshops. SaskOrganics is a farmer-led membership non-profit organization. We serve all (over 900) certified organic entities throughout the value chain in Saskatchewan by advocating a sustainable and thriving organic community through leadership in research, market development and communications.